De Geuzen: a foundation for multi-visual research » Democracy: Do Not Clean! Given today’s political climate we’ve decided to exhume this classic project. 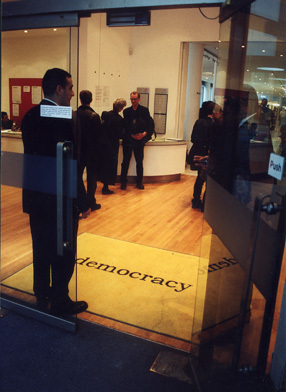 Contribution to group exhibition Democracy!, Royal College of Art, London . Featuring the work of: ArtLab, B.a.d. Foundation, Jeremy Deller, Clegg & Guttman, Annika Eriksson, De Geuzen, Carsten Holler, Group Material, Jeanne van Heeswijk, Aleksandra Mir, Dave Muller, Nils Norman, No Problem Agency, Mejor Vida Corp., Oreste, Carissa Rodriguez & Jodi Busby, Rigo 2000 & LPDC, Hinrich Sachs, Sarah Tripp, Superflex, Punish, PH Studio, Cesare Pietroiusti, Plamen Dejanov & Swetlana Heger, Stephen Willats.